A few months ago, we stumbled across a service — HelpScout — that met all of our needs, and we couldn’t be happier with it. We sell and support multiple products. We want all our team members to participate in support. We want to keep it simple — we want the primary interface to be email. Most services assume that you support one product (or service), and everything else (architecture, design, pricing, etc.) is based on that assumption. HelpScout, out of the box, provides support for multiple products, or mailboxes in their terminology. For each of your products, you simply redirect the incoming email on your support address into a unique email address associated with the corresponding HelpScout mailbox. The paid plan (and there are only two plans — free and paid) includes unlimited mailboxes. Most services are priced per support agent, which made them too expensive for us to include all three of our team members. HelpScout is also priced per support agent, but at $15 per person, we can afford to allow all three of our team members to participate for only slightly more than many services charge for a single person. 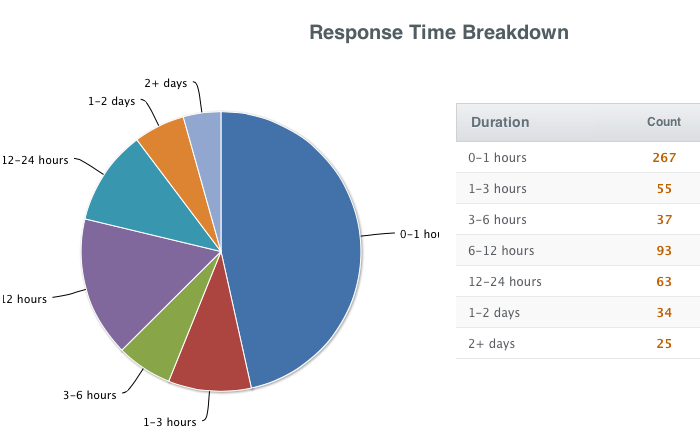 …as well as some nice graphics and charts related to overall volume and response time. If I have to remember to login to a website to manage our customer support requests, chances are I’ll end up getting hopelessly behind. HelpScout is based on the idea that your primary interface to customer support will remain email — i.e. you receive incoming support requests as email, and you respond with email. And HelpScout has taken some steps to make email-based support even more effective, especially across teams. @spam — results in the message being marked as spam and trashed. @note Justin can you jump on this one since it requires server access? — supports my assignment of the ticket to Justin with a special note. You might reply to a customer asking for clarifying information, and in the meantime they’ve already followed up their own original email with the additional information. The web based user interface is very well designed, both from visual and interaction design perspectives. Based on the email addresses of your customers, HelpScout scans the internet, pulling in relevant customer-related information such as LinkedIn profiles, Twitter and Facebook IDs, etc. 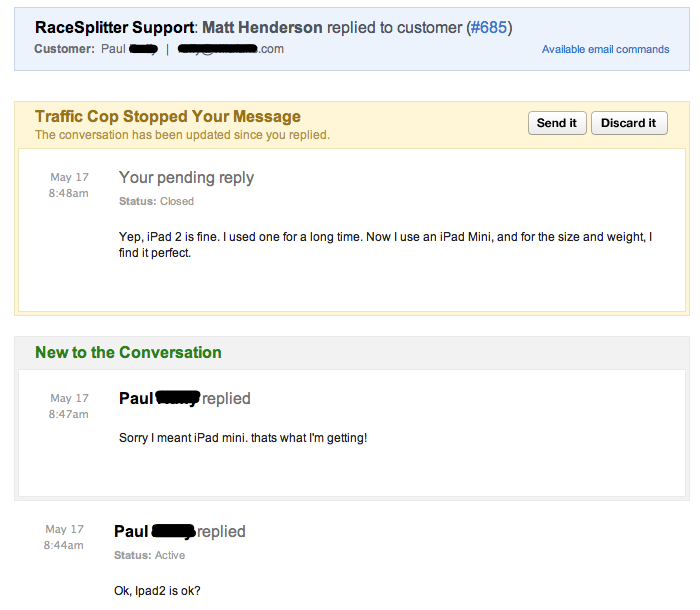 HelpScout’s customer support itself has been fast, friendly and helpful. HelpScout provides access to an API. We use that to retrieve our customer list from time to time. We’ve been very satisfied with the HelpScout service so far (and very happy to have finally found a service that fits our needs), and so we plan to stick with it.